July 4th is just around the corner. While red, white and blue are the standard colors of this holiday season, it’s also fun to think of new ways to celebrate America’s biggest national holiday. This year, take your 4th festivities up a notch with a fun, sophisticated and ultra-cool white party. Using all white decor, incorporating white foods, and asking your friends to dress in their favorite summer whites, you can take July 4th from traditional Americana, to a chic, modern event. Everyone loves balloons, and white balloons can help set the right atmosphere for your July 4th white party. Just fill them with helium and let them float indoors or outside. You can tie them to a balcony, deck, or even leave them floating to the ceiling indoors. Be sure to use them in bunches to make a big statement. A large gathering of white balloons is sure to add that special festive touch. To bring a little color in, tie them with gold or silver ribbon. If you’re not close the fireworks, bring the show to your friends and family by setting up a sparkler station. Fill a basket with enough sparklers for each guest and be sure to have matches on hand. Have everyone light their sparklers at once, and celebrate the 4th in style. You may not have fireworks, but an event filled with sparklers will surely light up the night. 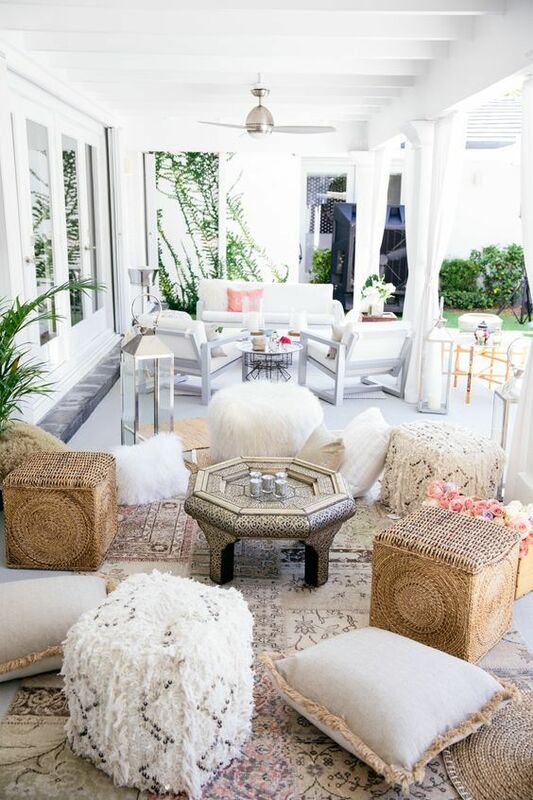 For your white party, look for ways to integrate the theme in all white decor, accessories and even tableware. These starry straws are perfect for celebrating the stars and stripes on the American flag. Mix them with white and gold striped straws as well, and you have an Independence Day display. Place straws in the evening’s speciality drinks or have them at the ready for guests who are enjoying sodas and punch. Hang a unique garland to usher in the holiday. This beautiful white tissue paper garland can be hung on your deck, around a table, or even in trees to decorate a gorgeous, white-themed party evening. Choose garland with bright white and natural tones for a little bit of contrast. Metallic accents are also nice as they pick up on the celebratory July 4th theme. For a white party, you can even color coordinate the food to keep the theme going. S'mores are great for summer parties, and especially for July 4th. To set up a s'mores station you’ll need a small grill where guests can toast up their scrumptious marshmallow and chocolate sandwiches. No grill? No problem. Whip up this s'mores skillet dip in the oven. Keep the color theme going for your festivities by using tableware in crisp white. White wicker baskets and porcelain dishes like these from Crate & Barrel are the perfect serving dishes for fruits berries, and other sweet holiday treats. In addition to your s'mores station think of other yummy foods that your guests can be served that will help keep them cool on such a hot day. We love these nectarine and coconut milk popsicles that can be made the night before for guests to enjoy at your event. Not only will it keep them cool and refreshed, but these popsicles will be the perfect accent to your white party decor.